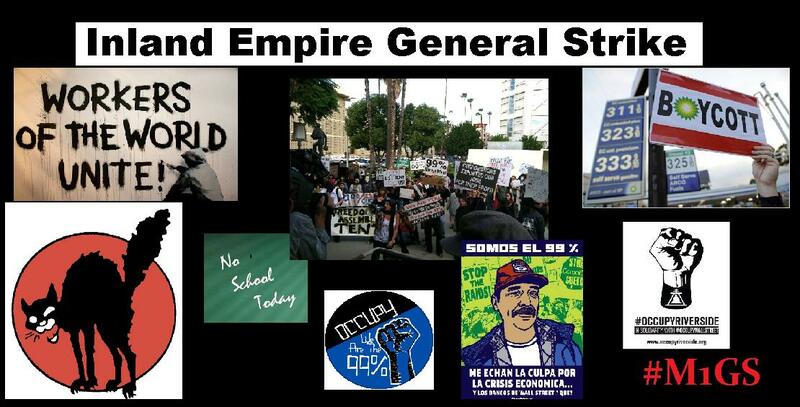 Occupy Riverside, in cooperation with our friends and allies, is working to make May 1 a day of community empowerment in which individuals disengage from the institutions and practices that oppress us, and engage in activities that foster community and humanity. We are starting with 5 days of "Spring training" to gear up for the big day! It all starts on Thursday, April 26, with a Free Education Fair at People's Plaza (Main and University in dowtown Riverside). Workshops begin at 3 and go until 8, with a dinner break in between! To get involved, give a workshop, talk, skillshare, or lecture, or to help with dinner, please sign up on the facebook page. There are still slots available. Day 2 is Friday, April 27, when we will rally against the banking giant Wells Fargo for the injustices they commit, especially for their profiting from private detention centers. Click the link to find out more! Rally to smash ICE Detention Centers! Day 3 is Saturday, April 28, when we will meet at People's Plaza at noon for a march to a nearby gas station to protest the high gas prices and the ecological destruction wrought by the petroleum companies. We will be creating awareness about the May 1 gas and driving boycott. Day 4 is Sunday, April 29, when we will again "Hit the Streets!" to create awareness about the May 1 General Strike with signs, posters, banners, song, et cetera. We need your creativity! Meet us at Bordwell Park on Martin Luther King and Kansas Avenue. Day 5 is Monday, April 30, when we will remind the students of RCC and UCR about the May 1 student strike and invite them to join us after the on-campus events. Meet at RCC digital library at 11:00 AM. May 1 is the General Strike! In the morning, join in solidarity events with your family members, neighborhood, congregation, school, workplace, or whoever you call "community." Activities are also taking place on UCR campus at 2:30 at the Belltower, and at RCC as well. At noon, join Occupy Riverside as we return to the Wells Fargo at University and Market for a nonviolent direct action protest. At 1:00, we will join the Justice for Immigrants Coalition of Inland Southern California to support their rally for immigrant rights and workers' rights at City Hall, and march all together to Bordwell Park. At 3:00, there will be a community celebration at Bordwell Park with grocery giveaways, a free market with clothes and books, and many other activities for the whole family! At 7:00 a Critical Mass bike ride departs from Bordwell. All are free to join in! This is your May Day, and it will be what you make it. The future is ours!